If one pound is good.. two pounds is better, right? Order the Mrs. Fisher's 2LB Container of Chips by selecting one of the flavor/varieties available. Choose from Regular, Rippled, Barbeque, Dark or our NEW French Onion flavor. 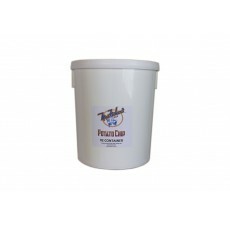 Our varieties of homestyle potato chips arrive fresh and are always prepared with the finest care. Try heating them up—you won't regret it.